Having saved many and clothing them with might. Persuading many towards God to revere the Word. Showing his calling by bringing works. Tychicus does not mean by chance. He was an Apostle by nature. And at the right hand of the Father he beholds the Word. Bringing souls to Christ the King. Saint Sosthenes was leader of the synagogue of Corinth after Saint Crispus and his household had been baptized by the Apostle Paul. In the Acts of the Apostles (18:17) it says that the Greeks took Sosthenes, chief ruler of the synagogue, and beat him before the judgment seat. Sosthenes was converted by Saint Paul, who opens his First Epistle to the Corinthians with these words: "Paul, called to be an apostle of Jesus Christ through the will of God, and Sosthenes our brother, to the church of God which is at Corinth" (1 Cor. 1:1). Later, Sosthenes became Bishop of Colophon in Asia Minor near Ephesus. Concerning Saint Apollos, it is written in the Acts of the Apostles (18:24-19:1): "Meanwhile a Jew named Apollos, a native of Alexandria, came to Ephesus. He was a learned man, with a thorough knowledge of the Scriptures. He had been instructed in the way of the Lord, and he spoke with great fervor and taught about Jesus accurately, though he knew only the baptism of John. He began to speak boldly in the synagogue. When Priscilla and Aquila heard him, they invited him to their home and explained to him the way of God more adequately. When Apollos wanted to go to Achaia, the brothers and sisters encouraged him and wrote to the disciples there to welcome him. When he arrived, he was a great help to those who by grace had believed. For he vigorously refuted his Jewish opponents in public debate, proving from the Scriptures that Jesus was the Messiah. While Apollos was at Corinth, Paul took the road through the interior and arrived at Ephesus." Paul mentions Apollos in the First Epistle to the Corinthians (1:12): "I have planted, Apollos watered, but God gave the increase," he says. Some sources say Apollos succeeded Sosthenes as Bishop of Colophon, while elsewhere it says he became Bishop of Ceasarea. Saint Kephas should not be confused with the Apostle Peter, since the name Kephas translated into Greek is Peter, which means "rock." Eusebius, in his Ecclesiastical History (Bk. 1, Ch. 12), writes: "This is the account of Clement in the fifth book of his Hypotyposes, in which he also says that Kephas was one of the seventy disciples, a man who bore the same name as the apostle Peter, and the one concerning whom Paul says, 'When Kephas came to Antioch I withstood him to his face' (Gal. 2:11)." However, the Apostle Paul makes it clear that when he refers to Kephas in his writings, this Kephas is none other than the Apostle Peter. Therefore, we know nothing of this Kephas, except that some sources place him as a Bishop of Iconium or Bishop of Colophon in Pamphylia. 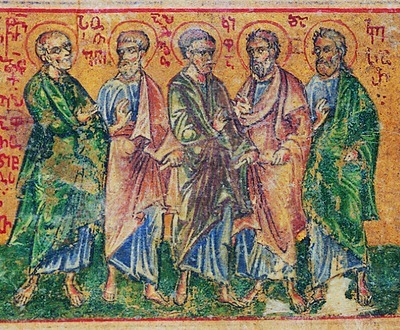 Saint Tychicus' name appears in the Acts of the Apostles (20:4), and in Saint Paul's letters to the Colossians (4:7) and the Ephesians (6:21). In the Epistle to the Ephesians the great Apostle writes: "That you also may know mine affairs, and how I do, Tychicus, a beloved brother and faithful minister in the Lord, shall make known to you all things: whom I have sent unto you for the same purpose, that you might know our affairs, and that he might comfort your hearts." Saint Paul also says in the Second Epistle to Timothy (4:12), "Tychicus have I sent to Ephesus." Tychicus is said to have been either the successor of Sosthenes as Bishop of Colophon, or the Bishop of Ceasarea. Another tradition has him as the first Bishop of Neapolis in Cyprus, where there are churches dedicated to him in Paphos and in Inner Galata. Saint Epaphroditus was the delegate of the Christian community at Philippi, who was sent with their gift to Paul (Philip. 4:18) during his first imprisonment at Rome. He is mentioned in the Epistle to the Philippians (2:25-30) by Saint Paul, who writes, "But I think it is necessary to send back to you Epaphroditus, my brother, co-worker and fellow soldier, who is also your messenger, whom you sent to take care of my needs. For he longs for all of you and is distressed because you heard he was ill. Indeed he was ill, and almost died. But God had mercy on him, and not on him only but also on me, to spare me sorrow upon sorrow. Therefore I am all the more eager to send him, so that when you see him again you may be glad and I may have less anxiety. So then, welcome him in the Lord with great joy, and honor people like him, because he almost died for the work of Christ. He risked his life to make up for the help you yourselves could not give me." Hippolytus' list of the Seventy Disciples includes "Epaphroditus, bishop of Andriace." Other sources say he was the first Bishop of Philippi, or of Andriaca (there are at least two ancient towns called Andriaca, one in Thrace and one in Asia Minor, and Nikodemos the Hagiorite refers to one in Cyprus), or first Bishop of Terracina, Italy. Saint Caesar is said to be mentioned by Saint Paul in the Epistle to the Philippians (4:22), where he says: "All God’s people here send you greetings, especially those who belong to Caesar’s household." However, commentators of this passage indicate that this Caesar is in fact Nero, and those of his household were converts among Nero's palace staff. According to tradition he became a Bishop in the Peloponnese, either of Coronea or Dyrrhachium. 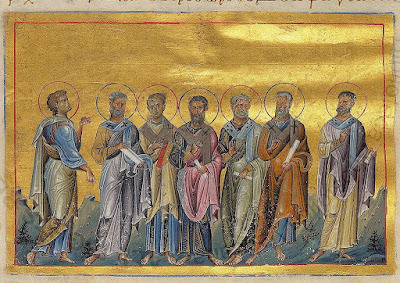 These holy apostles conducted themselves in a God-pleasing manner, shepherded the flock of God in a venerable way, and so governed the Churches entrusted to them. 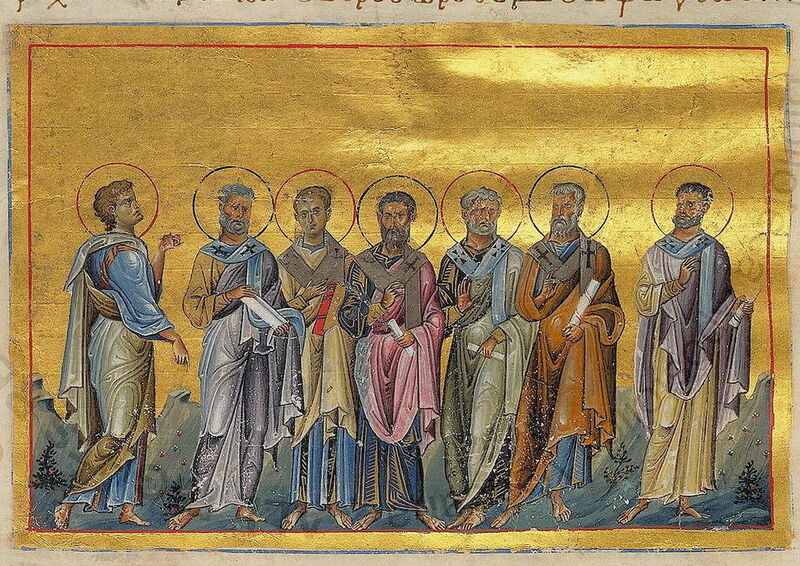 These blessed apostles endured many trials and persecutions from the idolaters for the sake of Christ's holy faith. When they completed their earthly sojourns, they delivered their souls into the hands of God. As a disciple and follower of Paul, you joyfully fought the good fight for the faith, raising up the torch of truth and bringing enlightenment to the nations. For this, All-revered Tychicus, honoring you we now cry out: Rejoice the chosen vessel of Christ, rejoice apostle of God, and do intercede that we all be granted redemption.